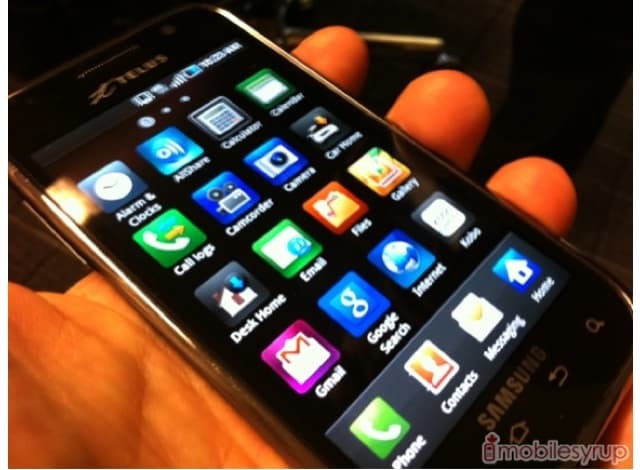 Samsung Galaxy S Fascinate 4G to hit Telus in 30-60 days? Samsung being the choice for Canadians and their mobile fix have a rather special guest coming to Telus, hopefully within the next two months, in the form of the Samsung Galaxy Fascinate 4G. This to be the first 4G handset released to a Canadian network and it comes loaded with Android 2.2,Froyo with an update to Gingerbread in the works which has been confirmed for the European Galaxy S. You'll be powered by a 1GHz processor underneath a 4inch Super Amoled screen as shown by the picture thanks to the guys over at mobilesyrup. On the back you'll have a 5 megapixel snapper with a 4 x digital zoom and on the front a camera to take advantage of video chat over Skype and the like. If you like your music the Samsung Galaxy S 4G has 16GB of internal storage and you can extend that with a microSD card. It has been reported that you'll be able to get download speeds of 21 Mbps or Megabits per second which is pretty quick. Samsung and Telus are very excited about this and of course the people that matter are you, so are you excited about it and will this be your next upgrade? While you think about that here's what Samsung and Telus had to say about it all. laptop or tablet from wherever they connect to the TELUS 4G network. run multiple applications at once. Canada a running on Canada's fastest coast-to-coast mobile 4G network*." the way for Canadians, as they embrace the power of wireless technology. - Google Maps Navigation providing turn by turn voice guidance and new Google Maps in 3D. Available only on Android. mobile phone vendor in Canada.